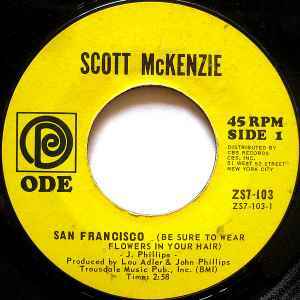 Two different singles exist as Ode ZS7-103. One of the two has AG-ZS7-103-1 hand-etched in the dead wax on Side 1. This pressing has an echoed and compressed tympani in the bridge that does not appear on either the LP or the other Ode single, which has the letter AF-ZS7-103-1 hand-etched in the dead wax. AF-ZS7-103-1 is the "hit" single version. This was released in 1967, I bought this copy in those days.